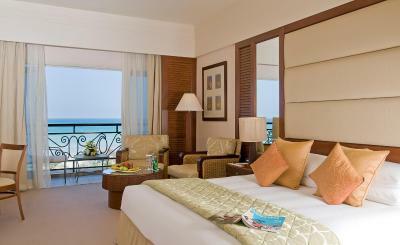 Lock in a great price for Danat Jebel Dhanna Resort – rated 8.1 by recent guests! Staff was very nice to us and allowed early check in. Restaurant Offer is decent considering outside of the hotel there are no option walking distance. Worth going for the half board options definitely! Good staff. It stop before long drive back to Saudi. Clean beach. Clean hotel. 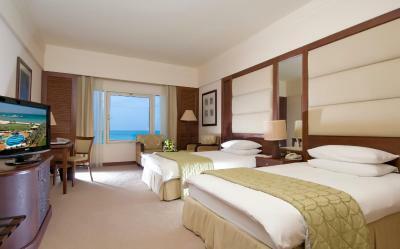 I really liked the beach, cleanliness of the hotel and rooms. Also the staff inside the hotel were all very friendly and helpful. It was a great overall experience specially because of the location of the hotel and the beach and sea water over there is amazing. Very nice pool, comfortable room, and very helpful staff: they tried hard to give us an upgrade (but there were no rooms), they gave us a late check out, and they called us to let us know we had forgotten something in the room. There’s an African security guard that’s been there for years and he’s demeanor is nothing short of spectacular. These are the types of people that shape improvise adapt and overcome to a whole new level. Educate Inspire Change is a meaningful term in regards to this. This man is brilliant , I’ve witnessed him solve issues in a calm sense that is second to nothing. I wanted to send a rating before the email that’s the class he is in. It would be an honour to see him promoted and then smile , shake hes hand and enjoy the excellence he deserves. The Filipina ‘ Isa kang alamat ‘ ( legend). Sometimes there are special spots , but more than that , special people , to help you in winding down. Magnificent in no uncertain trrms. Puts a smile on my face!!!! The room was clean. 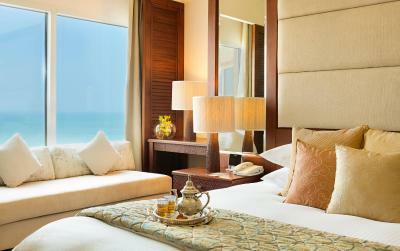 The location is good if you’re visiting the Anantara for a day visit. Other than that I wouldn’t recommend this place. The place and it's surrounding are really quite. Far from the busy life in Dubai. It is very nice by the beach. We were upgraded from rooms to a villa. The live band at the bar are very entertaining and great. 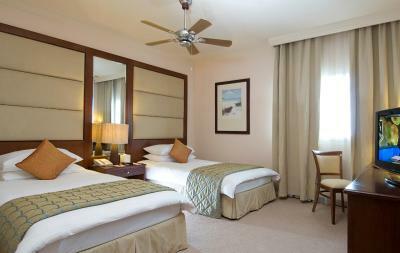 Danat Jebel Dhanna Resort This rating is a reflection of how the property compares to the industry standard when it comes to price, facilities and services available. It's based on a self-evaluation by the property. Use this rating to help choose your stay! This 5-star resort features half a mile of private white sand beaches. 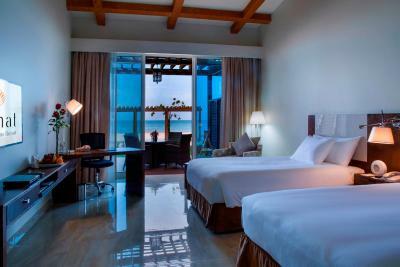 It has a spacious outdoor pool with a swim-up bar, and offers elegant accommodations with views of the gulf. 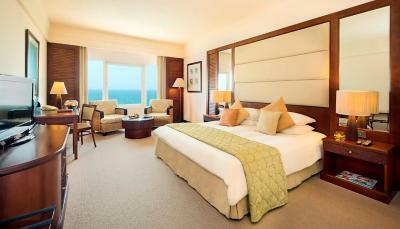 The Danat Jebel Dhanna Resort has a variety of waterfront villas, rooms, and suites. Each one features luxury bedding, a sitting area, and satellite TV. Some include balconies with lagoon views, and kitchenettes. The Danat Resort offers a range of dining options including Tides, an all-day dining bistro, and Zaitoun, a fine-dining Italian restaurant. Cocktails and refreshing beverages are available on the grounds. 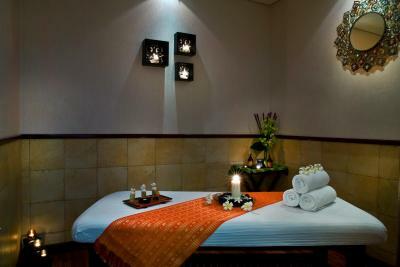 Danat Jebel Dhanna Resort guests can enjoy a relaxing massage on the beach, or visit the fitness center. The hotel has a children’s playground, and offers a bike rental service. Recreational activities include snorkeling, windsurfing, and boat cruises. 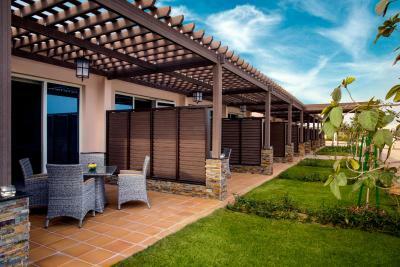 This property also has one of the top-rated locations in Jebel Dhanna! Guests are happier about it compared to other properties in the area. This property is also rated for the best value in Jebel Dhanna! Guests are getting more for their money when compared to other properties in this city. 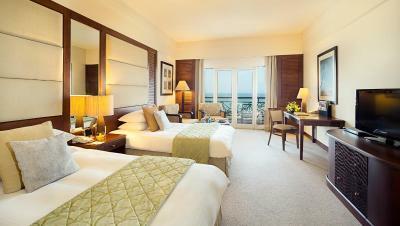 When would you like to stay at Danat Jebel Dhanna Resort? Features gulf views and a mosaic-tiled bathroom. 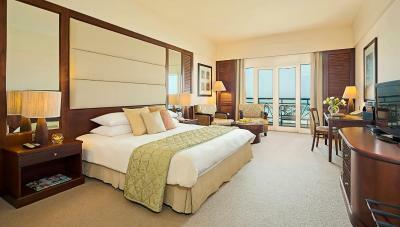 Features a private balcony with Arabian Gulf views. 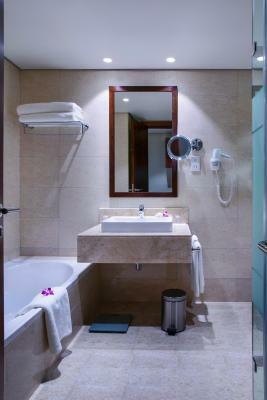 Spacious mosaic-tiled bathroom has premium bathroom amenities. Features a private balcony with pool view and a mosaic-tiled bathroom with premium toiletries and a separate shower and bathtub. 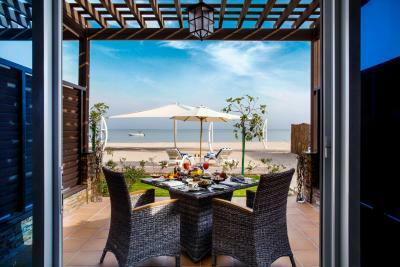 Offering views of the Arabian Sea, this villa includes an open plan living room, a kitchenette and a spacious tile bathroom. It has a private lawn with lounge chairs only 100 ft from the beach. 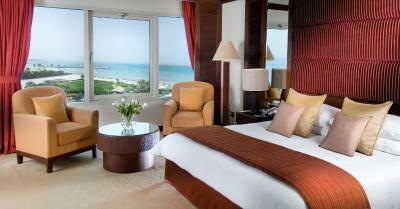 Features Arabian Gulf views and a mosaic-tiled bathroom with separate shower and bathtub. 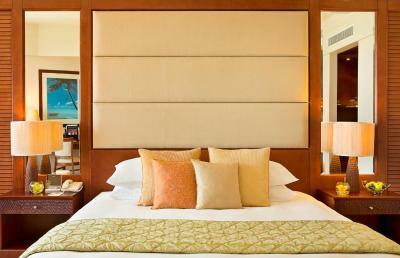 Spacious suite with a separate sitting area and views of the pool, the gardens, and the beach. It also includes a mosaic-tiled bathroom with a selection of amenities. This spacious suite has an open-plan living area with a kitchenette and bar. It also includes a mosaic-tiled bathroom with a selection of amenities. 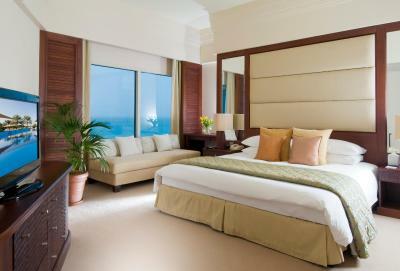 Large, modern room with views of the gulf and a spa bathtub. 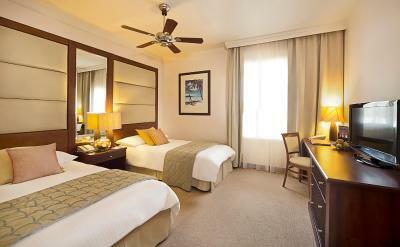 This twin/double room has air conditioning, iPod dock and mini-bar. 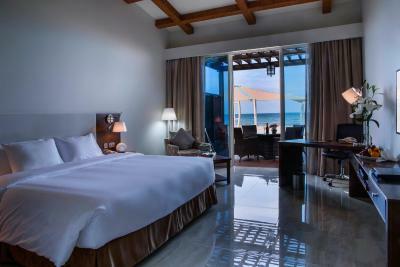 House Rules Danat Jebel Dhanna Resort takes special requests – add in the next step! Danat Jebel Dhanna Resort accepts these cards and reserves the right to temporarily hold an amount prior to arrival. As per the UAE Government regulations, all adult guests registered in the room at the time of check-in must present either their original passport with visa with latest entry stamp or UAE Valid Emirates ID. The hotel reserves the right to refuse the room to the guests on non-availability of proper identification. Service was a bit random - only one towel in the room, took two tries to get more and we never got the small ones... Beach is pretty nice but with industrial construction going on on both sides of the bay. 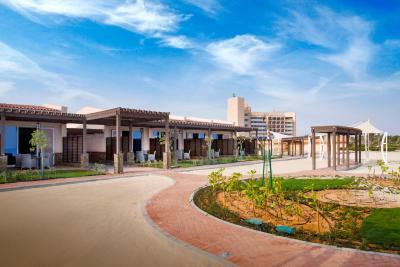 Nice little resort, very well maintained, close to a few Abu Dhabi islands, perfect for a staycation. We booked the rooms ground floor but only 7 of them really face the beach, our villa was slightly behind, should be mentioned when booking I think. The beach towel system with the card is a bit unnecessary,1st time we experience this. Very little to be honest. There is a limited amount of choice for hotels in this area but this isn't the responsibility of the hotel. 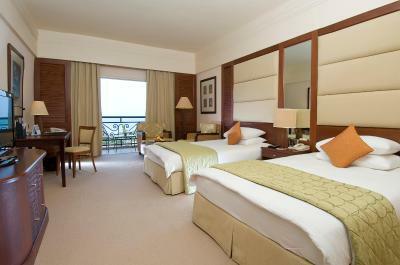 Beautiful hotel, super efficient friendly staff, A high level of cleanliness and a fantastic location. The cost of our stay was relatively high however I would highly recommend this location to anyone. 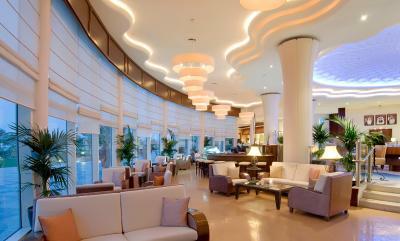 The beach area is absolutely stunning, the staff are considerate and courteous. Many thanks, we look forward to staying again. Near refinery, old fittings, limited activities for kids. Took 30 minutes to check in. All inclusive package was not explained. Limited info about facilities upon check in. Only one pool. No mini bar as part of the all inclusive package. Very quiet hotel. Lots of people in work overalls from the nearby oil refinery which took the holiday vibe away from the restaurant. Fantastic food on the 'All inclusive' package. Beach chalet room was spacious and had a sea view. Good selection of beverages. Well only 2 things i didn't like, one of the reservation operators when i was confirming the booking wasn't very professional or helpful. The restaurant for Dinner could use a bit more variety in the type of food they are serving. The process to book the sir baniyas island trip, which was the main reason for choosing this hotel, is unnecessarily complicated and ultimately doesn't work: We called to ask about availability and were told to send an email. We did, then we got an email back saying there was no availability for the 1st day and would we like them to check for the next. We emailed back saying yes, please check. Then we emailed them again at 3PM when we got no answer only to be told there is no availability for the second day either. When we complained, we were told we were supposed to book at least a week in advance. This is not stated anywhere on the website, so we had no way of knowing that. Also, instead of suggesting to us a booking for the next day, the person should have checked for availability first. The whole system of booking this trip is faulty and frustrating, and information is not available anywhere. Very disappointing. The AC wasn’t working. The breakfast was really expensive.